We’d love your help. Let us know what’s wrong with this preview of The Panic of 1819 by Murray N. Rothbard. The Panic of 1819 was America's first great economic crisis. And this is Rothbard's masterful account, the first full scholarly book on the topic and still the most definitive. It was his dissertation, published in 1962 but nearly impossible to get until this new edition, the first with the high production values associated with Mises Institute publications. The American The Panic of 1819 was America's first great economic crisis. And this is Rothbard's masterful account, the first full scholarly book on the topic and still the most definitive. It was his dissertation, published in 1962 but nearly impossible to get until this new edition, the first with the high production values associated with Mises Institute publications. The American Economic Review was wild for this book when it appeared: "Rothbard's work represents the only published, book-length, academic treatise on the remedies that were proposed, debated, and enacted in attempts to copy with the crisis of 1819," the reviewer wrote. "As such, the book should certainly find a place on the shelf of the study of U.S. business cycles and of the economic historian who is interested in the early economic development of the United States." And specialists have treasured the book for years. It is incredible to realized that some American historians think of MN Rothbard as the author of this book and nothing else! Rothbard tells the story about a disaster that could not be attributed to some specific government blunder or disaster. It seemed to originate from within the economic system itself. Its cause was not obvious to observers at the time. Confronted with something new, the Panic engendered much discussion and debate about possible causes and remedies. As Rothbard observes, the panic provides "an instructive picture of a people coming to grips with the problems of a business depression, problems which, in modified forms, were to plague Americans until the present day." To ask other readers questions about The Panic of 1819, please sign up. Rothbard goes through great lengths to explain the economic climate of the states at the time in order to provide a background for the panic. He shows how extensive borrowing before 1819 was and that this was indeed the source of the panic. The 1819 bubble was close in kin to the real estate bubble in the early 90's: speculators saw a great opportunity to buy land as its value had been rising for quite a while. These speculators saw to it to buy as much as they could wit Another Rothbard classic. Rothbard goes through great lengths to explain the economic climate of the states at the time in order to provide a background for the panic. He shows how extensive borrowing before 1819 was and that this was indeed the source of the panic. The 1819 bubble was close in kin to the real estate bubble in the early 90's: speculators saw a great opportunity to buy land as its value had been rising for quite a while. These speculators saw to it to buy as much as they could with money they could borrow. Once the land started declining in value, a panic emerged. Lenders feared that speculators would be inabile to pay back their extensive loans. This resulted in speculators turning to congress to provide "debt release". The US government, under the leadership of James Monroe, refused to issue debt release and let the bubble run its course. This, contrary to popular opinion, was a common way for the government to handle economic panics prior to the great depression. I liked it, although I found that an overview at the start of the book would have helped me understand Rothbards message. The Panic of 1819 is Rothbards first work on economic history and I found that at times the reader would be overwhelmed with information. I therefore find that the work is better suited for those specially interested in the economic history of the US rather than your average layman. “The Panic of 1819” by Murray Rothbard is an extremely informative book, but was not as interesting as I had hoped. It was certainly interesting, but in a different way than I had expected. The panic of 1819 resulted in intense economic debate throughout the country, much of which Rothbard paints as expansionists versus hard money advocates. 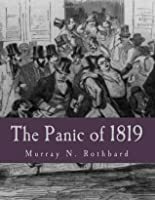 Following the economic collapse after the post-war boom, a large section of the population favored a return to prudence, thrift, and economy rather than legi “The Panic of 1819” by Murray Rothbard is an extremely informative book, but was not as interesting as I had hoped. It was certainly interesting, but in a different way than I had expected. The panic of 1819 resulted in intense economic debate throughout the country, much of which Rothbard paints as expansionists versus hard money advocates. Following the economic collapse after the post-war boom, a large section of the population favored a return to prudence, thrift, and economy rather than legislative interference. There were loud factions calling for an abandonment of specie payments banks, establishment of inconvertible money by the states, and minimum appraisal and stay laws to help debtors. Leading up to the panic, banks had extended too much credit and flooded the market with notes with no specie backing them up. This inevitably increased asset, commodity, and real estate prices, fueling the temporary prosperity. When contraction came as the bank notes depreciated and banks failed, those voices argued for the same inflationary policies that had caused the boom and bust in the first place. 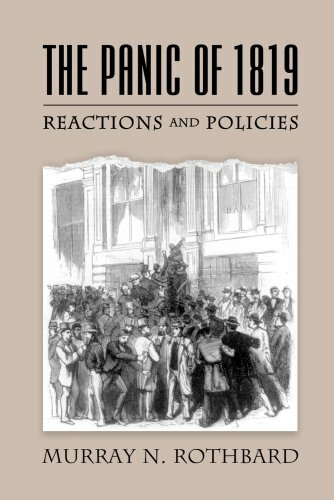 Rothbard describes in detail how each state reacted to the panic and how the general public and influential figures wrote and spoke on these economic issues. He does a fantastic job pulling from the newspapers of the day, quoting editorials from a wide range of writers. It is fascinating how history repeats itself, but the discussions and opinions change. Hard money advocates, while a significant faction back at that time, are now considered part of the lunatic fringe by much of the mainstream. Free banking, 100% reserve banking, and fully redeemable currency are opinions/issues that you will never see in any major newspapers today. However, many extremely respected people held those opinions back then. I truly do not believe that these opinions have lost their validity as potential solutions; the causes and problems surrounding economic booms and busts are still the same at their core. I hope to see these discussions return to the mainstream in the future, but I am not optimistic. I mostly enjoyed this book. It was definitely not an easy read, and I ended up doing a lot of side research to understand many of the economic stuff. Rothbard did a really solid job bringing up all the facets of the depression, along with the public response around the country. I was very happy to read the Conclusion and Remedies Proposed chapters, as they clarified the whole book for me. great esoteric read for anyone interested in early 19th century american history, or the beginnings of the american business cycle. As Rothbard lays out in the beginning, the Crisis of 1819 was the first major bust in the U.S. business cycle and for that reason should be of interest to economists today. As the title suggests, Rothbard's dissertation is an extremely detailed and extremely value free review of not so much the causes and time leading up to, but the general reactions of the people, great esoteric read for anyone interested in early 19th century american history, or the beginnings of the american business cycle. As Rothbard lays out in the beginning, the Crisis of 1819 was the first major bust in the U.S. business cycle and for that reason should be of interest to economists today. As the title suggests, Rothbard's dissertation is an extremely detailed and extremely value free review of not so much the causes and time leading up to, but the general reactions of the people, state government and federal government in the aftermath of the recession.